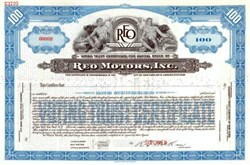 Beautifully engraved SPECIMEN certificate from the Reo Motors, Inc. This historic document was printed by the American Banknote Company in 1939 and has an ornate border around it with a vignette of the company logo between allegorical men. This item has the printed signatures of the Company’s Agent. The Olds Motor Co. was incorporated in 1897. The initial capital investment was $50,000.00. In 1897 the company produced 4 automobiles his first gas powered vehicle to the public. The asking price was one of $1,000. R. E. Olds was affiliated with Oldsmobile for 8 years; from August of 1897 through January of 1904. R. E. Olds went into competition with Oldsmobile. After leaving the company in 1904 he formed REO Motor Vehicles. In the years of '05 and '06 more REOs were sold than Oldsmobiles!